Scottish Attachment In Action’s annual conference ‘Why Attachment Matters in Play’ focused on Theraplay. Theraplay is a child and family therapy aimed at enhancing and building attachment, self-esteem, trust in others, and joyful engagement. 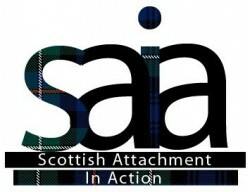 Edwina Grant opened the Scottish Attachment in Action (SAIA) Conference in December 2014 by explaining the importance of play – the building block of human development – and the relationship between Dyadic Developmental Psychotherapy and Theraplay. Sheila Lavery, a facilitator who teaches the principles of Theraplay, explains how Theraplay can be used by foster and adoptive parents, inviting the audience to try out some the techniques. Roberta Manners of the Theraplay Institute concludes by explaining the structure and dimensions of Theraplay: engagement, attainment, nurture and structure. She also demonstrates an activity ‘caring for hurts’. The podcast link has also been added to the Resource Library.